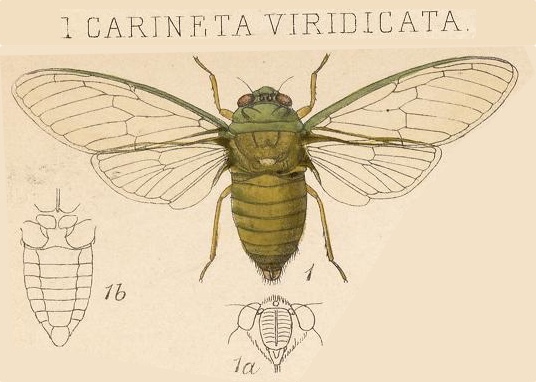 Carineta viridicata Distant, 1883, is a cicada found in Panama. Head and pronotum bright grassy green; the first with the area of the ocelli pale brownish, the eyes dark brownish. Mesonotum greenish ochraceous, with two curved darker lines at anterior margin connected near their apices by two waved lines, which form the anterior margins of a large greenish patch situate in front of the cruciform basal elevation, a lateral greenish fascia and the base rather strongly pilose. Abdomen pale ochraceous, the lateral margins slightly suffused with greenish. Body beneath and legs ochraceous, the face, opercula, and lateral margins of the abdomen pale greenish. Rostrum ochraceous, with the apex slightly pitchy. Tegmina and wings pale hyaline, the basal venation of both and the costal membrane of the first pale greenish, the apical venation more or less ochraceous. The face is very tumid; the rostrum just passes the intermediate coxa? ; the anterior femora are armed with three strong spines, the first and longest near base, the other two near apex; the opercula are very small and obliquely rounded. The first apical area of the tegmina is twice the length of the second. The illustration comes from Biologia Centrali-Americana. Insecta. Rhynchota. Hemiptera-Homoptera. Vol. 1. By W. L. Distant F.E.S. and The Rev. Canon W. W. Fowler, F.L.S. (1881-1905). Read it on the Biodiversity Heritage Library website. 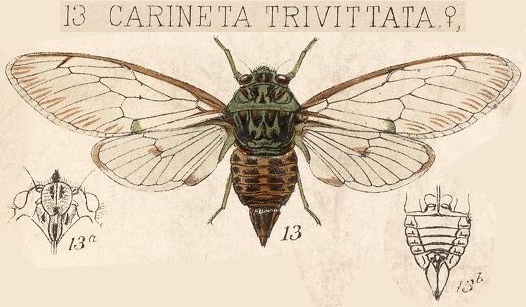 Carineta trivittata Walker, 1858 is a cicada found in Mexico, Guatemala, Panama, and Costa Rica. 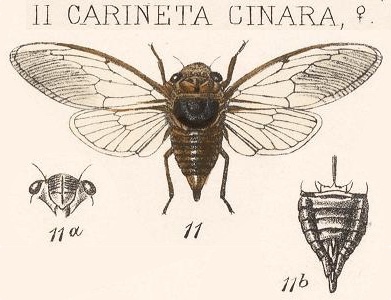 Carineta cinara Distant, 1883, is a cicada found in Panama. Body above castaneous, sparingly covered with greyish pubescence. Front of head pale ochraceous, with a central longitudinal impression. Pronotum with a central [hourglass]-shaped space, denoted and bordered by striae, on each side of which are two oblique striae, the outer one submarginal and somewhat curved. Mesonotum darker in color, with two very ill-defined discal paler fasciae; cruciform elevation at base ochraceous. Body beneath concolorous, with the face pale ochraceous. Tegmina and wings pale smoky hyaline; tegmina with a central pair of longitudinal smoky fasciae in apical areas (excluding first), those in the eighth area indistinct, and a single series of the same on outer margin. The head, including eyes, is about equal in width to mesonotum, and narrower than base of pronotum. The face has a narrow central longitudinal sulcation, the sides are strongly transversely striated, with the interstices wide apart. The abdomen beneath has the lateral margins much raised. The anterior femora are armed with three long and strong spines, and the posterior tibiae with three inner and two outer long, slender, marginal spines. First apical area of the tegmina very much longer than the second. 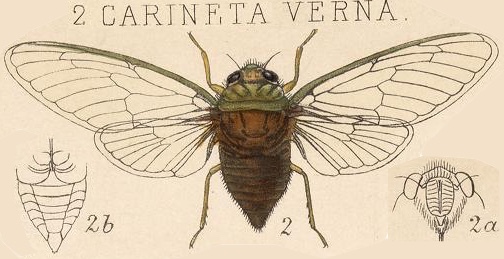 Carineta verna Distant, 1883, is a cicada found in Panama. Head with the vertex pale castaneous, the front greenish and the eyes fuscous. Pronotum green, tinged with ochraceous. Mesonotum dull ochraceous, with two faintly indicated central obconical spots at anterior margin, a small rounded black spot near each anterior branch of the cruciform basal elevation, and the basal lateral margins pale greenish. Abdomen above and beneath pale castaneous. Head and thorax beneath pale greenish ochraceous and pilose; legs ochraceous, more or less tinged with greenish, tarsal claws and the extreme apices of intermediate and posterior tibiae fuscous. Rostrum ochraceous, the apex pitchy and reaching the posterior coxae. Tegmina and wings pale hyaline, the venation greenish and ochraceous; first apical area much longer than second, and about equal in length to fourth, fifth, and sixth. Anterior femora armed beneath near apex with three prominent and distinct spines, gradually decreasing in size. 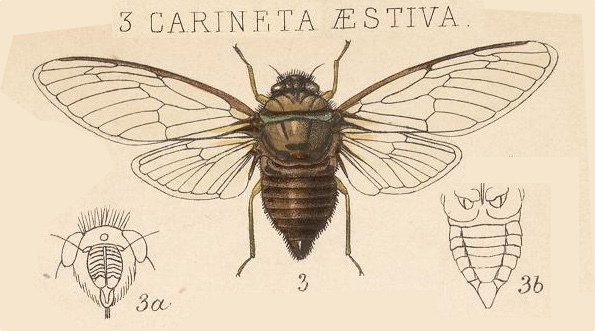 Carineta aestiva Distant, 1883, is a cicada found in Panama. Head pale castaneous, very hirsute, the front ocelli and eyes ochraceous. Pronotum ochraceous tinged with greenish, the anterior and posterior margins olivaceous, the last inwardly fuscous. Mesonotum dull dark ochraceous, with two faintly indicated central obconical spots at anterior margin, two large and contiguous black spots between the anterior branches of the basal cruciform elevation, a more obscure black spot on each side of the same, and the basal lateral margins pale greenish. Abdomen above and beneath castaneous. Head and thorax beneath ochraceous and pilose; legs pale castaneous; coxae, femoral apices, and tibial bases ochraceous. Rostrum pale castaneous, the base ochraceous, the apex pitchy and reaching the posterior coxae. Tegmina and wings pale and very slightly smoky hyaline; venation ochraceous towards base, and pale fuscous towards apex; first apical area much longer than second, and about equal in length to fourth, fifth, and sixth. The face is long, moderately convex, with a distinct narrow longitudinal sulcation and somewhat faint transverse striations. Anterior femora armed beneath and near apex with three spines, the first, long an prominent, the others small. Pia Öberg from Sweden took this cicada photo back in 2004 at Hotel do Ypê in Itatiaia NP in Brazil. Thanks to Roy Troutman and cicada expert Allen Sanborn we were able to ID this pretty cicada as a Carineta diardi (Guérin-Méneville, 1829). In addition to Brazil, C. diardi is also found in Argentina. More of Pia’s photos on Flickr. What a fun way to start the New Year. Happy New Year cicada maniacs!